Sandwich ELISA showing detection of human interferon gamma using HCA043 as a capture reagent and HCA044 as a detection reagent. 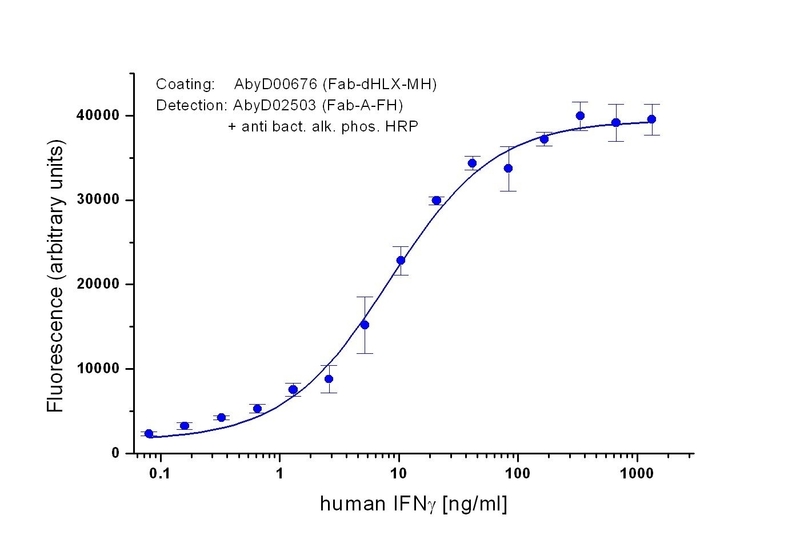 Human anti Human interferon gamma antibody, clone AbD02503 recognizes human IFN gamma, a key cytokine in the immune response. A lyophilized, bivalent human recombinant Fab selected from the HuCAL® GOLD phage display library. Expressed in E. coli and purified using NiNTA affinity chromatography. This Fab fragment is bivalent by dimerization of the bacterial alkaline phosphatase fusion protein. The antibody is tagged with a DYKDDDDK tag and a HIS tag at the C-terminus of the antibody heavy chain. Purified recombinant human interferon gamma. 1 For use as a capture reagent in Sandwich ELISA we recommend the use of HISPEC ASSAY DILUENT for sample and antibody dilution.